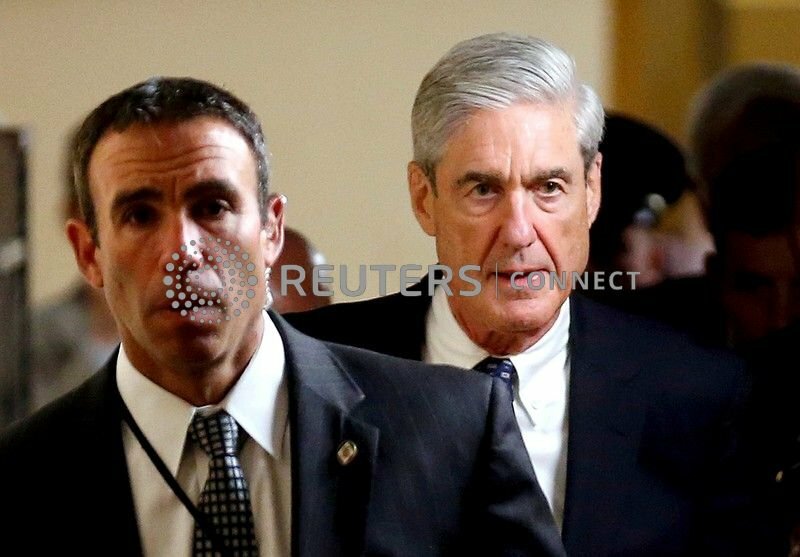 WASHINGTON (Reuters) - Special Counsel Robert Mueller on Friday handed in a long-awaited report on his investigation into Russia's role in the 2016 presidential election and any potential wrongdoing by U.S. President Donald Trump, setting off a clamour from lawmakers in both parties for the document's release. Mueller submitted the report to Attorney General William Barr, the top U.S. law enforcement official, the department said. The report was not immediately made public - Barr will have to decide how much to disclose - and it was not known if Mueller found criminal conduct by Trump or his campaign, beyond the charges already brought against several aides. Trump has denied collusion and obstruction. Russia has denied election interference. The Russia investigation has cast a shadow over Trump's presidency and ensnared key figures including his former campaign chairman Paul Manafort, national security adviser Michael Flynn and personal lawyer Michael Cohen, who already have either been convicted or pleaded guilty to charges brought by Mueller. Barr, a Trump appointee who took up his post in February, told lawmakers in a letter that he may be able to provide information to Congress on the report's findings as soon as this weekend. Barr in his letter said he did not find any proposed actions by Mueller that were inappropriate or unwarranted. Lawmakers from both parties, including the Democratic chairman and the top Republican member of the House of Representatives Judiciary Committee, called for prompt release of the report to key congressional committees and to the American public. "I fully expect the Justice Department to release the special counsel’s report to this committee and to the public without delay and to the maximum extent permitted by law," said Doug Collins, the committee's senior Republican, in a statement. House Speaker Nancy Pelosi and Senate Democratic leader Chuck Schumer - the two top Democrats in Congress - said it was "imperative" that the full report be made public and that the White House play no role in determining what is released. "The American people have a right to the truth. The watchword is transparency," they said in a joint statement. Under the regulations governing special counsel investigations, the attorney general must share an outline of Mueller's report with Democratic and Republican leaders of the judiciary committees in Congress but it is largely up to him what to make public. When the Justice Department announced the arrival of Mueller's report, Trump was at his Mar-a-Lago property in Florida. "The next steps are up to Attorney General Barr, and we look forward to the process taking its course. The White House has not received or been briefed on the Special Counsel's report," White House spokeswoman Sarah Sanders said. Trump has sought to discredit the investigation, calling it a "witch hunt" and accusing Mueller of conflicts of interest. Mueller has brought charges against 34 people, including Russian intelligence officers, and three Russian companies, including one described as a "troll farm." Regardless of whether the report is released, Mueller's team already has signalled the direction of the investigation through indictments and hundreds of related court filings that have offered extensive details about Russian interference in the election. Trump fired Flynn in February 2017 after it emerged that he had misled Vice President Mike Pence and the FBI about his dealings with the then-Russian ambassador to the United States, Sergey Kislyak. In May 2017, he ousted Comey, whose agency had been leading the Russia investigation. Comey's firing led the Justice Department to appoint Mueller to take over the probe. A small number of House Democrats have pushed for Congress to impeach Trump and remove him from office but the party's leadership including House Speaker Nancy Pelosi has urged caution. No president has every been removed from office via impeachment. It's looking so far like it was what many suspected the infamous "nothing burger" This thread should be fun for a laugh. and influence in US, you are above the law. Another reason why the rest of the world withdraws our support for you. You are now an isolationist economy, so go it alone. Meanwhile China is making friends is on the arise. Fool US. Yeah China is making all kinds of "friends" through enslaving them with debt. Anyway this is about what amounted to a witch hunt not China. Republicans: This ends the farce...now let's get on with the business of running the country. Democratics: This is just the beginning! Sad day for democracy when a 2 year investigation sends many minions to jail and fails to find that the bosses of the minions were involved. Power and corruption wins again. They were all sent to jail on charges not even related to the probe. Even Cohen who was testifying before congress before he got thrown in prison said there was no collusion. All news channels here in the USA even the main stream nightly news are reporting no new indictments. That would include Trump obviously. So now that's out of the way we can get back to passing an infrastructure bill and begin making America great again. So now that's out of the way we can get back to passing an infrastructure bill and begin making America great again. Not so fast. There now needs to be a serious investigation into how the witch hunt started. Did democrat players really pay dodgy spy Steele to gin up the dossier that started it all? Does Steele himself these days still stand by his dossier? This farce has overshadowed Trumps term so far. As I have said before, if the witch hunt was kicked off for political reasons by Trumps opponents, and does not prove he colluded with Russia to cause Clinton to lose her rightful victory, the clock must be reset to zero. Trump must be allowed to restart his first term. No other option in my mind. I agree. Where is the Special Counsel investigating the Democrats? Someone started this and now has to answer for it. Too much money was wasted on this witch hunt. The American taxpayer deserves to know. There are dozens of sealed indictments arising from the Mueller investigation. You have no idea whatsoever what they allege, plus of course what will be alleged by State level investigations. Nor what the Mueller team have recommended for further action. At this stage you and others are only making assertions based upon assumptions. If you say so.... it is known now there are no new indictments from Mueller. The state level stuff will be from when Trump wasn't in office. Checkmate. Funny how quiet it has become most of the usual suspects are absent.